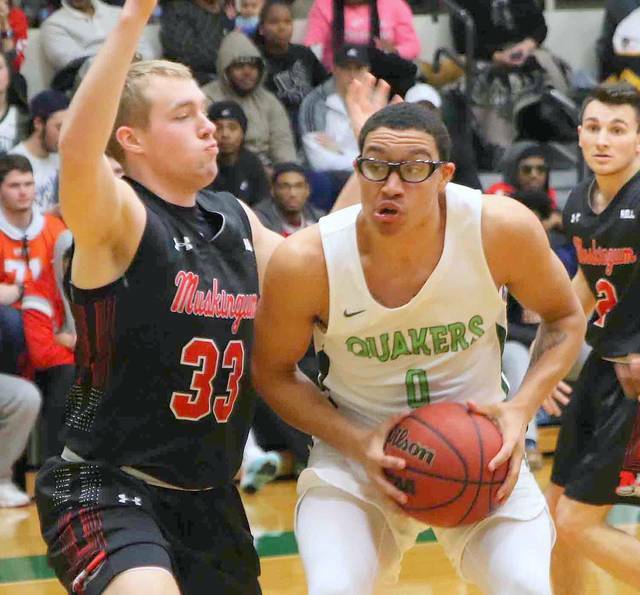 NEW CONCORD – Making just his second start of the season, Jeffery Mansfield led Wilmington to an 84-82 win over Muskingum Wednesday in Ohio Athletic Conference play. The win lifts Wilmington to 15-6 overall and 11-4 in the OAC. Muskingum drops to 7-15 overall and 3-12 in the conference. Mansfield had 15 points, five rebounds, two assists, five steals and two blocked shots. He led WC in rebounds, steals and blocks. But the Quakers didn’t get off to a good start. Muskingum led 7-0 less than three minutes in to the game. Wilmington battled back and neither team took command of the game in the first half. The two teams were tied at 34-34 at the break. The Muskies swam to the lead 46-41 early in the second half. Mansfield had a stickback basket at 16:26. But Muskingum was stout in its play and was up by nine, 55-46, with 13:22 to play in the second half. WC tied the game at 57 but the Muskies went back up 66-59. It was still a seven-point difference when Wilmington made its final push. DaeShawn Jackson hit a three at 4:45 and another at 4:01, crediting Aaron Mullins and Andrew Russell with assists. Mullins drained a three at 3:04 to give WC a 73-71 advantage. Muskingum reeled off seven straight points to go up five with 77 seconds to play. Jackson made back to back three-pointers to cut it to 80-79 with 40 seconds to go. After Muskingum took an 82-79 lead, Mansfield made two free throws at 31 seconds and a layup with 13 seconds to play, putting WC up 83-82. The relentless Wilmington High School product continued his whirlwind play down the stretch with a steal and free throw to seal the win.